A Country Divided: Japan's Electric Bottleneck Rolling blackouts in the Tokyo area are crippling businesses as diverse as automakers and fishmongers. The blackouts could continue for months, even years, as Japan struggles to bridge the gap between different power grids operating in its eastern and western regions. 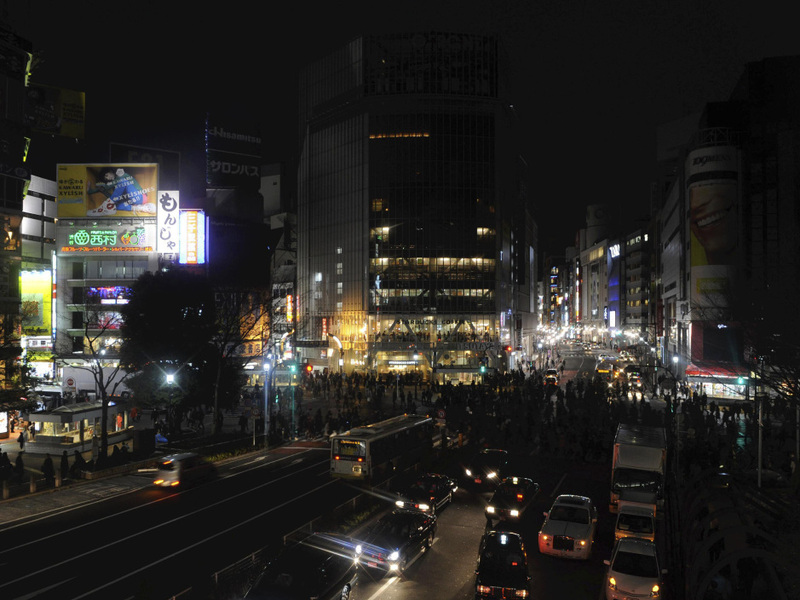 Advertising boards on buildings are seen without illumination at Tokyo's Shibuya district. Rolling blackouts are crippling a number of industries. Even on a slow day, Tsukiji market, the largest fish market in the world, is a beehive of activity. Motorized carts buzz down narrow aisles carrying tuna carcasses. They're sawed into chunks and shipped to restaurants in Tokyo and around the world. Normally, these aisles would be jammed with buyers. But on a recent day, they're nearly empty. Mr. Kaoru, a wholesaler, blames the blackouts. "I predict one-third of the wholesalers in the market will close the shop, the business," he says. "[The] main reason is the power source." Rolling blackouts continue in the Tokyo area following the loss of power generation at the damaged nuclear plants in Fukushima. Tokyo Electric Power Co., the giant utility that serves the region, has lost 20 percent of its power capacity. Blackouts are crippling businesses from auto producers to fishmongers. The rolling blackouts are also reducing train service, making commuting unpredictable. So people don't stay downtown eating and drinking after work. The result is that fish sales at Tsukiji fish market are down about 50 percent. In the morning, the blackouts mean some rail commuters can't get to work on time. That's a problem for big auto manufacturer Nissan. "Electricity going down creates its own damage," says Andrew Palmer, a senior vice president at Nissan. He's trying to get the company's auto plants up and running. But he's plagued by power outages that shut down production lines and damage equipment. "Certainly the power outages are something we have to work with," Palmer says. "Obviously, it's partially a negotiation with the local authorities." Japan's electric infrastructure comprises two main power grids. One system, in the west of the country, operates at 60 hertz, like power in the U.S. The eastern parts of the country, where Tokyo and Fukushima are located, run on a 50-hertz system, like the one used in Germany. Ordinarily, this isn't a problem — there are enough power plants in each of the grids that electricity can be shifted around if there are spikes in power demand or outages at a plant. There are also ways to pass some power across the 50-hertz/60-hertz divide between the power systems, but this is only available for a limited amount of electricity. The trouble comes when there's a big, unplanned shortage of power, like what's going on now with the destruction of the Fukushima Dai-ichi nuclear power plant. Creating new linkages between the 50-hertz and 60-hertz systems is incredibly expensive and couldn't happen for years. So Tokyo Electric Power Co., or TEPCO, which operates the stricken plant, is rapidly trying to secure more power to make up for the loss in production. Until that happens, though, Tokyo could see more rolling blackouts or other measures introduced to reduce electrical demand. But so far TEPCO, one of the biggest privately owned power companies in the world, says it can't guarantee power to anyone. "When blackouts are required we do not discriminate among our customers, whether industrial or residential," the company says. "This is a real problem for those factories which need uninterrupted supplies," says professor Tatsuo Hatta, president of the National Graduate Institute for Policy Studies in Tokyo. He says the situation might cause some companies to move. "It's clear that from their viewpoint they'd better move their plant to the western part of Japan where electricity is plenty." It might seem much easier to send the surplus power from one side of Japan to the other to ease the blackouts. But that's harder than you might think, Hatta says. "One major problem is that the east and west of Japan have different electric cycles and the capacity of the connectors are very much limited," he says. That's partly an accident of history. Eastern Japan followed the German model and has a 50-cycle electrical power grid. The western part of Japan used the American model and has a 60-cycle grid. Transferring power from one grid to another requires a very expensive facility. And there are only three connections between eastern and western Japan. That bottleneck means the power transfer is just a trickle, even during this national emergency. Creating more capacity would take years. Hatta says, up until now, Japan's big utility companies, including TEPCO, liked the arrangement, because it protected their monopoly pricing and made them very powerful politically. "The users of electricity like Japan Steel wouldn't say anything against electric utility companies — they are so afraid," he says. "And also many politicians wouldn't touch those electric utility companies." Hatta says the situation must change to reduce the stranglehold the utilities have on the country's energy users. "One possibility is that on this occasion [the] Japanese government nationalize TEPCO," he says. The government could keep TEPCO's transmission lines and sell off its power plants to smaller producers who would compete to sell power to customers. For the time being, TEPCO says it's doing everything it can to secure more power. The stakes are incredibly high. Power consumption normally doubles during the heat of the summer. Right now it seems unlikely TEPCO will be able to meet the demand, threatening more disruption for Japanese companies and workers, and greater damage to Japan's fragile economy.